Post a photo. When you find a rock, you can post a photo on the Facebook page for Aurora, Nebraska Rock Hide & Seek – but this is NOT a requirement. Posting photos allows artists to see their rocks were found and the smiles they bring. Re-hide the rock. When you find a rock, the idea is to re-hide it in a different location so the game keeps going. City parks, walking trails, public places, and outside stores or other buildings are all great hiding places. You want it to be found. Make sure it is hidden in a safe place. DO NOT hide it in any grassy area where a mower could run over it. DO NOT hide it on private property. DO NOT hide it on school property. DO NOT hide it inside of a business. Maybe keep a couple. Sometimes it is hard to let go of a really cool rock by hiding it again. This is OK. Keep a couple of rocks and re-hide the rest. Get some unpainted rocks. DO NOT take landscaping rocks from any business or from private property. Paint your rocks. You can be elaborate or simple. Markers, spray paint, acrylic paint, etc. Kids can paint rocks and adults can paint rocks. Please be sure all rocks are KID FRIENDLY – no one wants a child to come across something questionable. 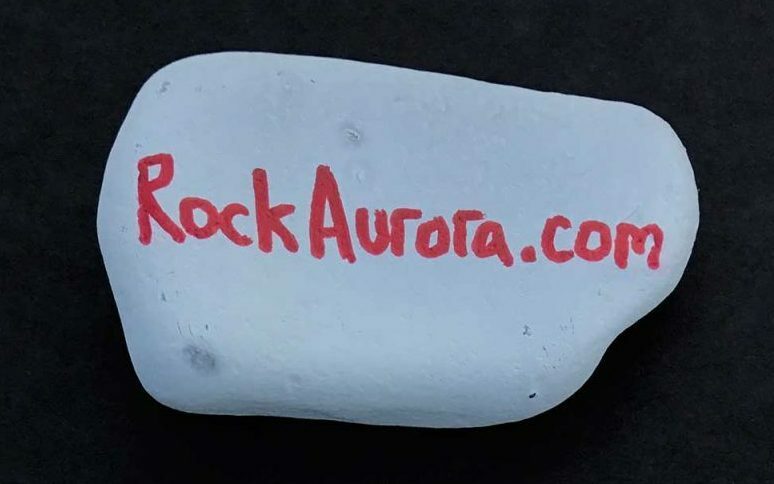 Consider writing “RockAurora.com” on your rocks so other people can find these rules and the link to the Facebook page. Hide your rocks. See the above description of hiding rocks. Copyright 2017, RockAurora.com. All rights reserved.